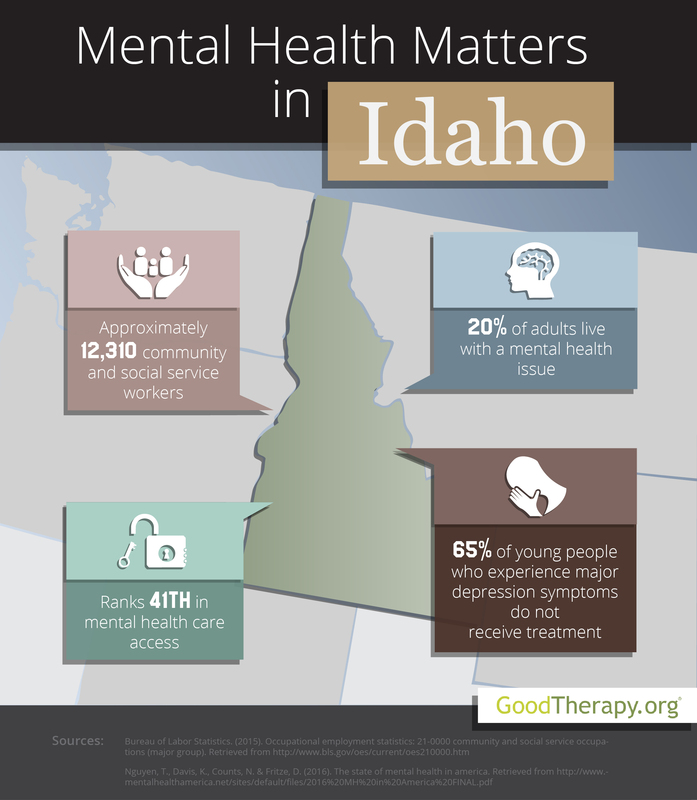 Find a therapist in Idaho with GoodTherapy.org. In 2015, the population of Idaho was estimated to be about 1.65 million people. Of this figure, the Bureau of Labor Statistics (BLS) reports about 12,310 residents worked in various social service and community-related occupations. These occupations included employment as psychologists who work with children, drug and alcohol detox center counselors, officers working in corrections, health educators, depression treatment therapists, religious workers, counselors at residential treatment centers, and licensed marriage and family therapists. In Idaho, workers in these professions earned an average yearly wage of $41,750. After evaluating mental health conditions, practices, and resources across the United States in 2016, Mental Health America (MHA) gave the state of Idaho an overall mental health rank of 45 out of all 50 states and the District of Columbia. Regarding major mental health categories, Idaho was 43rd in adult ranking, 42nd in youth ranking, 37th in prevalence of adverse mental health conditions, and 41st in access to mental health care. These rankings generally indicate a high prevalence of mental health conditions in both children and adults along with a low rate of access to mental health care. Statistics from the 2016 MHA report show nearly 20% of Idaho residents are affected by at least one mental health issue. The state was ranked 40th in this care metric. Of these affected adult residents, 20% were uninsured, while 26% of people with a disability could not obtain treatment due to financial restrictions. In these respective categories, Idaho was ranked a relatively low 34th and 36th. Therapists in Idaho may also be concerned about the mental and behavioral health of young people in the state. The Substance Abuse and Mental Health Services Administration (SAMHSA) reports that in 2012-2013, approximately 65% of teenagers in Idaho believed there was no significant risk in drinking five or more alcoholic beverages once or twice a week—higher than the national percentage. However, binge drinking in 2012-2013 among residents ages 12-20 was 12.6%, which is lower than the national percentage of 14.7%. In the 2016 MHA survey, Idaho was 36th for teens who abuse alcohol or drugs, 42nd for teens with at least one past year episode of major depression, and 45th for children who are insured with private insurance that doesn’t adequately cover emotional and mental issues. Adults and adolescents with mental health issues are urged to find a therapist in Idaho who is able to provide needed professional care. Though there may be some socioeconomic factors which may impact a person’s ability to receive treatment, many people who are able to take advantage of the health options in the state report improved health and higher quality of life.